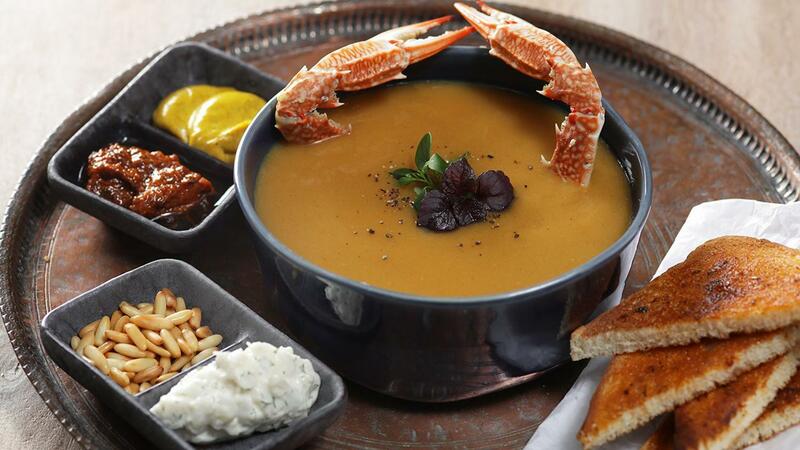 Soups are one of the best ways to break the fast at Iftar, they are warm and gentle on the stomach giving the body loads of vitamins, minerals and fluids which are easy to digest, and this is a very traditional recipe with a little twist, making it more modern. Wash the crabs thoroughly in cold running water. Bring the water to the boil and dissolve fish sauce into it. Add in the crabs and boil for 4-6 min depending on the size. Remove the crabs and place in the ice water to stop them from over cooking. Crack open the crabs and separate the meat from the shells, discard the gills and digestive system found on the underside of the crab. Heat the clarified butter and sauté the onions and leftover crab shells. Lower the heat, add the Garam Masala, turmeric powder and dried lemon now stir till fragrant, careful not to burn. Add in fish sauce, Knorr Coating Mix Marinade and water, bring to a simmer, cook for 15 minutes, add in the Knorr Lime Seasoning and remove the dried lemon. Blend everything till smooth and then strain through a chinois. Mix the Best Foods Real Mayonnaise with the Turmeric and black pepper and place into a side dish. Take half the crab meat and bind together with some of the Best Foods Real Mayonnaise, also place that in one of the side dishes. Serve with other condiments like pine nuts,chilli paste and toasted bread.